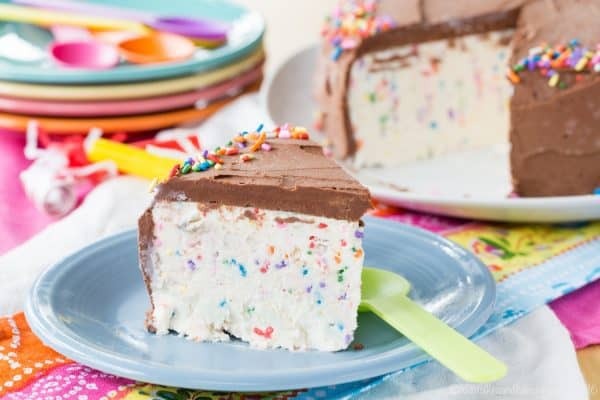 Birthday boys and birthday girls of all ages will have smiles on their faces when you whip up this super special but super simple frozen dessert. 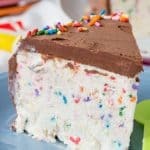 This Funfetti ice cream cake recipe makes a kid favorite dessert. It’s easy to make with an easy no-churn ice cream recipe! 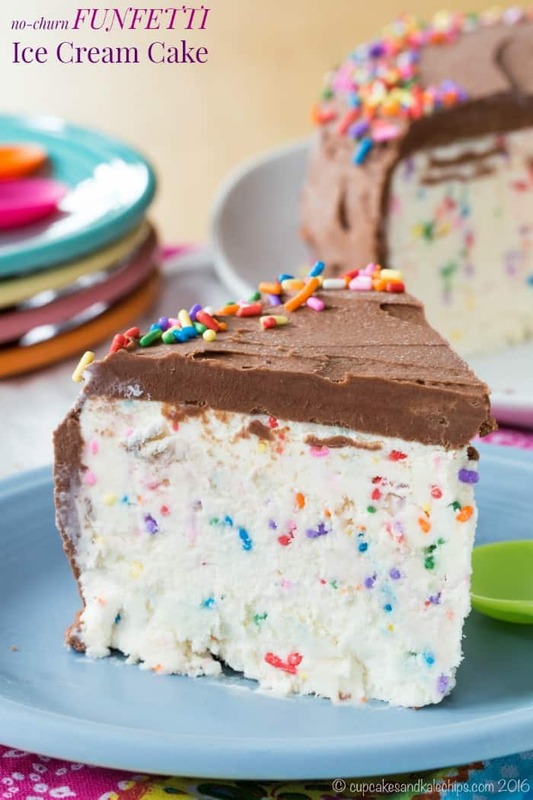 No boxed cake mix is required to create this no churn ice cream cake. 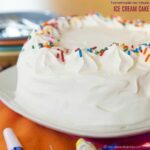 Birthday boys and birthday girls around the world will have smiles on their faces when you whip up a special dessert like this super simple homemade ice cream cake! You know, as you get older, you learn things about yourself. Or you discover things you already kind of knew, but then come to accept. I always envisioned that I’d be the kind of mom to throw fabulous themed birthday parties for my kids every year. We’d have creative games and homemade party favors and all kinds of cute decorations. And I will say, for a few years, I made a valiant attempt. The Bug had a bug-themed first birthday. I made centerpieces that looked like flowers with different pictures of him in the middle. There was bug confetti on the tables and molded chocolate lollipops that I hand-painted. Bee, beetle, and ladybug cupcakes complete with fondant wings, eyes, and stingers graced the table. For his second birthday, the theme was Yankees baseball, complete with Peanuts and Cracker Jack Cupcakes and a Pinstripe Cake. We had a hot dog bar with a vat of chili, plus whiffle bats and balls for all the kids. His third birthday was all about Jake and the Neverland Pirates, with treasure map wraps for lunch, buried treasure (i.e. M&M-stuffed) cupcakes, a treasure hunt, and gold doubloons all around. Little Dude had a monkey-themed first birthday party. Again, with some pretty adorable monkey cupcakes, and some were decorated with bananas. By then, I was done. I wasn’t all that into planning all the games and making all the favors. I thought I was really good at it till I became aware of the wonderfully awful thing known as Pinterest. Quickly realizing that I was not going to be the event planner I thought I might be someday. I had quickly been outpaced by people way craftier. For various reasons, the kids only had family celebrations for the past couple of years. Sure, I made Mint Chocolate Chip Ice Cream Cake and Hummingbird Cake and Banana Chocolate Chip and Nutella Layer Cake. We did things to try to make it special, like outings and family gatherings and such, but that was it. I was fine with it, and I hoped they were too. But this year, The Bug started Kindergarten, and I really wanted him to have a party, and so did he. I had all these ideas for a May the Fourth be With You party since his birthday is on May 4th, and he’s been in a major Star Wars phase for the past year and a half. Well, until he decided dinosaurs were his new passion. With a bunch of things going on in May, I finally gave in and just decided to have the party at a place where they would set up, clean up, order the pizzas, and run all the activities for the kids. Oh my gosh, it was the most brilliant thing I’ve ever done! I didn’t have to plan games and activities or clean my house before AND after. 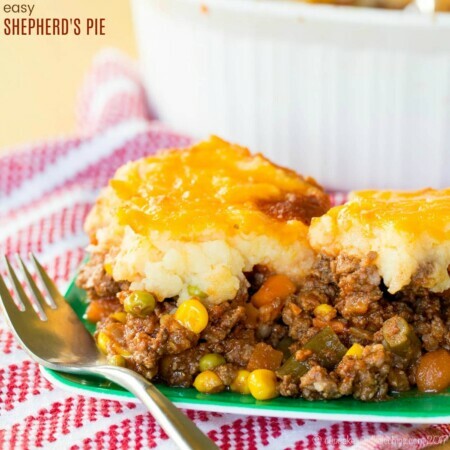 I didn’t have to slave in the kitchen for days to make stuff that a room full of six-year-olds would barely eat and not care about whether it was a blog-worthy recipe. There was no coordinating, running around, or going crazy. And all of this was especially helpful since I broke my foot! What I did get to do was make dinosaur fossil cupcakes with my kid. Pictures were taken while they played. I got to smile and laugh watching him enjoy having a total blast with his friends. When it was over, I got to come home and have a glass of wine while the boys relaxed and watched TV after all the excitement. Worth every penny, plus it also gave me time to make a Funfetti Ice Cream Cake recipe for our family celebration. And boy, am I glad I made this no churn ice cream cake! I mean, he was glad. Yeah, the birthday boy – It was all about the birthday boy, not his ice cream obsessed mama. For the record, I certainly had my share. 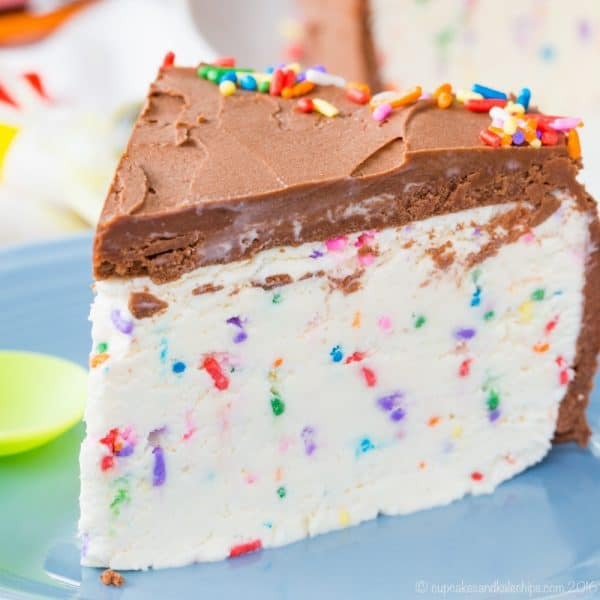 But when he saw the thick chocolate frosting, and then I sliced into the Funfetti ice cream cake to reveal the rainbow of sprinkles, he was one happy kiddo. Almost as happy as when he took his first bite and tasted that cake-flavored ice cream! 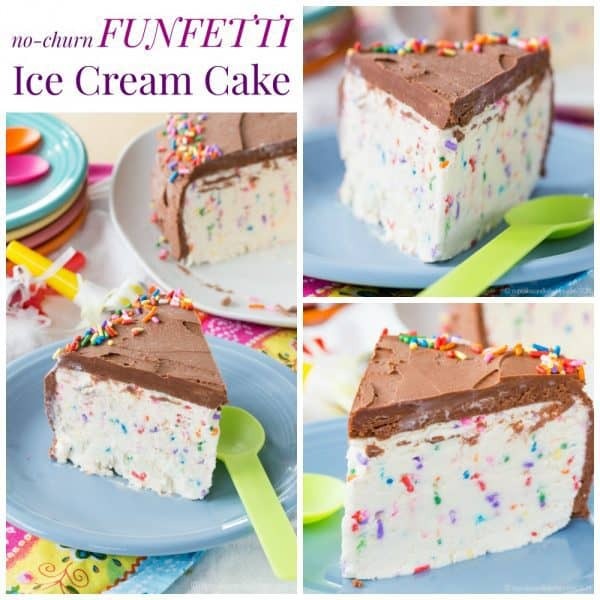 Is the Funfetti Ice Cream Cake recipe gluten-free? But here’s the thing. Most of the homemade cake batter ice cream recipes call for cake mix. Umm, hello, gluten allergy. Plus, I find no-churn ice cream to be fairly sweet already, so I didn’t feel like I needed to use a gluten-free cake mix to add even more sugar. Nor did I want flour in the Funfetti ice cream recipe, to potentially make it gritty, as might be likely with gluten-free flours. So, I just added what you would put into a homemade cake – butter, vanilla, and a pinch of salt. All of that plus sweetened condensed milk is folded into whipped heavy cream, along with a good helping of sprinkles. Pour it all into a springform pan (I like this one because, with the raised base, it’s easy to slide off the cake onto a serving plate), freeze, and frost. Then a few more sprinkles, because, duh! You can probably use any store bought or homemade frosting you like, or even whipped cream with some cocoa powder, but I went with this Two-Ingredient Easy Chocolate Buttercream Frosting from Cookies and Cups. It’s so easy, super chocolaty. 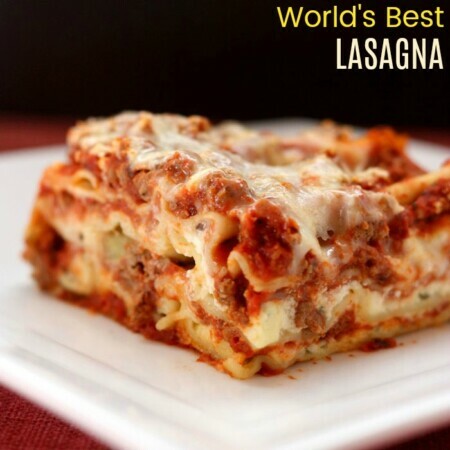 It adds to the homemade cake and frosting flavor, without being an actual cake. Perfection! 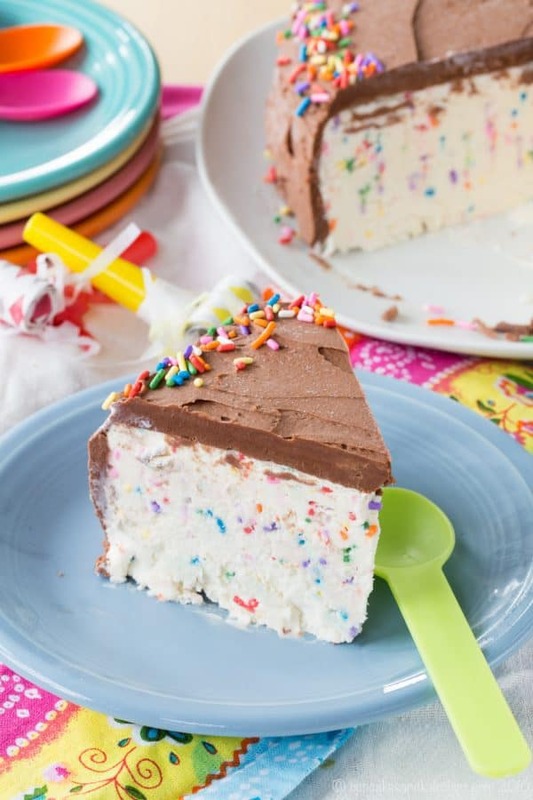 Mama loves you enough to outsource your birthday party so I can make you a homemade Funfetti ice cream cake recipe. And then cut a slice, photograph it, and reassemble it with the extra frosting before singing “Happy Birthday”. 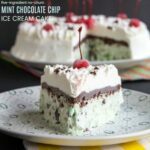 If you like no churn ice cream cake recipes, you might like these! This frozen dessert tastes like cake batter ice cream, but it’s not made with a boxed cake mix. The no churn ice cream is full of sprinkles and just shouts, “Happy birthday!”. Place a large bowl and beaters or whisk attachment into the freezer to chill for about 10 minutes. Line an 8-inch springform pan with plastic wrap (you can use a 9 inch pan if that's all you have, but cake will not be as tall). Combine the heavy cream, vanilla, and salt in the chilled bowl, and using the whisk attachment of a stand mixer or hand mixer, whip the cream to stiff peaks. Carefully pour the sweetened condensed milk and melted butter into the bowl, then gently fold into the whipped cream. Then quickly and gently fold in the sprinkles. Spread the ice cream evenly in the prepared pan and freeze for several hours, or until firm. After cake has been in the freezer for at least 2 hours, prepare the chocolate frosting. In a heatproof mixing bowl set over a simmering pot of water, melt the butter and chocolate chips, stirring frequently until smooth. 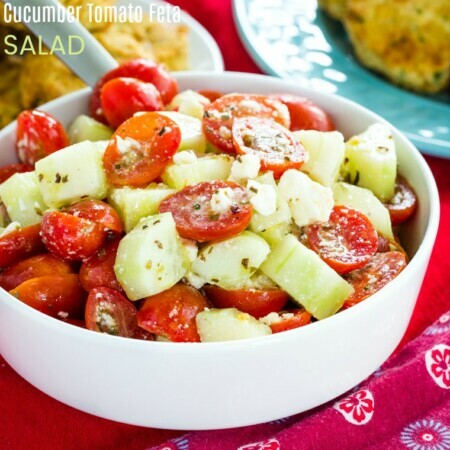 Remove from the heat, cool slightly, and then place the bowl in the refrigerator until solid, about 20 minutes. Remove bowl from refrigerator and allow to come up to room temperature. Using a hand mixer, beat on medium until light and fluffy. Remove cake from the freezer; quickly unmold and place on a serving plate. Frost evenly with the chocolate frosting. Decorate with additional sprinkles, if desired. Return to freezer to firm up the frosting until ready to serve. Frosting recipe from Cookies and Cups. 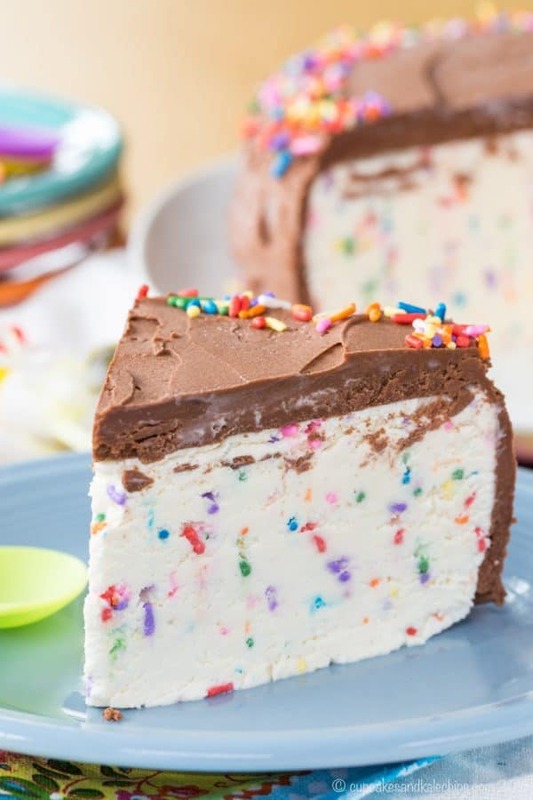 Enjoy this Funfetti no churn ice cream cake! 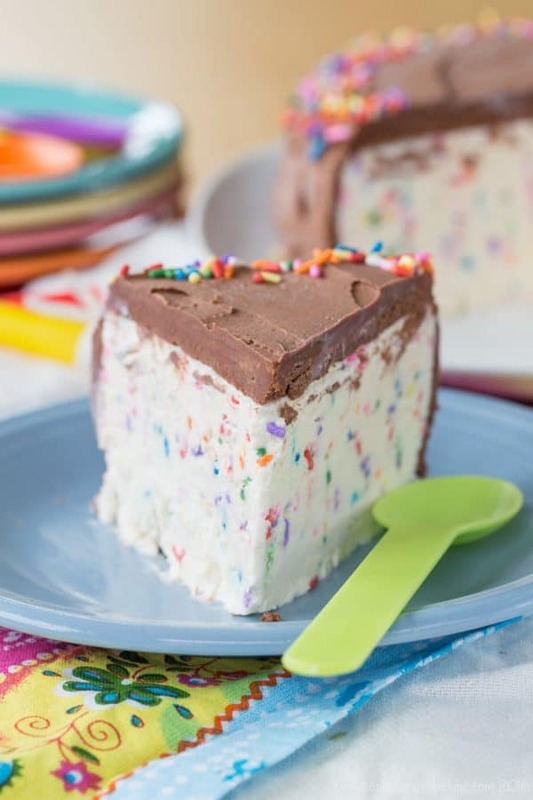 I have been looking for a funfetti ice cream recipe that doesn’t use cake batter mix, and this is perfect! I modified the recipe to decrease the fat (I replaced much of the heavy whipping cream with low fat milk), so I actually churned the ice cream base.. Anyway, my kids loved the results, and I know I will be making it again. Thank you! 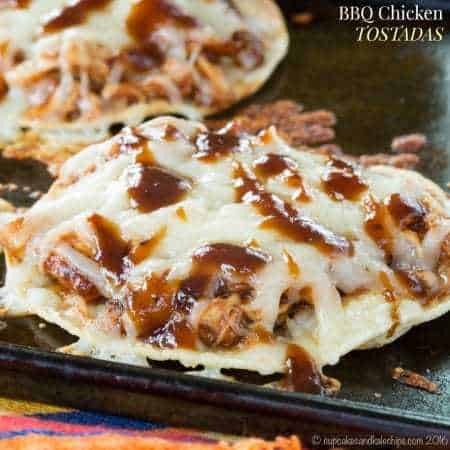 Super easy recipe. It was very creamy but it was definitely overly sweet Ice Cream Cake for my family. The hubs and daughter both love super sweet treats and both agreed that it was too sweet. If I try this again, I will double the amount of whipping cream and leave other ingredients the same. Looks incredible!! For MY birthday. You’re a wonderful mom and party-thrower. Let’s funfetta ALL THE THINGS !